A drone accidentally lands on the White House lawn. An out of control drone crashes into a crowd of spectators at a parade in a Massachusetts town, knocking several people to the ground. And makers of the latest Star Wars blockbuster force actors to walk between movie sets swaddled in blankets to avoid being photographed by-drones. And here you thought drones were just the latest generation of toy airplanes. It would seem that they're far harder to operate, and more controversial, than one would think. Which is why the question must be asked, do drones have a place on construction sites? Drones have been touted as a useful tool for some aspects of industry work, primarily mapping out and photographing areas on worksites. Used correctly, drones for construction could potentially save firms needing that type of information considerable time and money. So should you be heading out to Drones R Us to pick up your newest piece of equipment? You might want to hold off on that trip until the drone waters calm at the Federal Aviation Administration. Understandably alarmed by a number of incidents involving drones operated by amateur “pilots”, the agency is now in the process of passing regulations that in addition to requiring licensing to operate drones in construction, will probably restrict how drones can be used for commercial purposes. 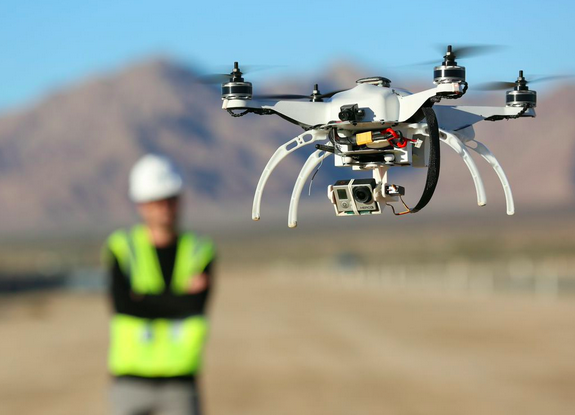 Does this mean construction firms must give up their drone dreams? Probably not, but below are some things to think about before making those dreams a reality. 1. Drones Are ExpensivePrices are dependent on what equipment is included with the drone, but they can range anywhere from $500-$50,000. 2. Drones Need "Flight Insurance"That story about that Massachusetts drone that landed miles from where it was supposed to is funny, until you consider that it was actually a wayward missile that easily could have smashed through multiple windows and into people, buildings, etc. Could your firm afford the additional insurance needed to pay for the rampages of a "rogue" drone? Keep in mind that this insurance should have provisions for accidents involving operators, "flight crews", and other onsite employees and visitors. 3. Drones Need A "Top Gun"Yes, they're unmanned, but drones need an operator. Once these new FAA regulations go into effect sometime this year, he or she will have to be a trained and licensed one as well, with certifications being renewed probably every two years. Only certified operators will be permitted to operate the drones, limiting who can use them on site. 4. There Are Restrictions As To Where Drones Can FlyDrones already may not be operated within a certain radius of an airport, generally within 2-5 miles of it. Expected additional FAA regulations will prohibit drones from being flown above 500 feet, and restrict drones to being operated at a distance that can be "viewed with the naked eye". This may limit how drones can be used. 5. Drones Need A Flight PlanBecause of all the restrictions of drone operation, firms will need to allocate time for preparing detailed plans for their drone's flight path, and assemble "flight" and potential "recovery" crews. Can they spare manpower for this?